Go to original pattern for design DROPS 113-13. Loosely knitted DROPS jumper with wide double cuffs in ”Kid-Silk” and effects in ”Cotton Viscose” or "Safran". Size S - XXXL. 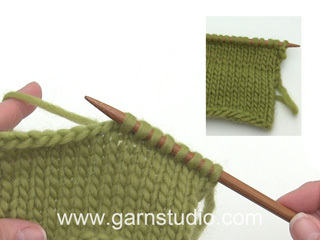 DROPS POINTED NEEDLES size 6 mm – or size needed to get 16 sts x 22 rows in stocking st with Kid-Silk = 10 x 10 cm. DROPS CROCHET HOOK size 3.5 mm – for tie string. KNITTING TIP: Make sure to start a new ball of yarn at the side and not mid piece. FRONT PIECE: Worked back and forth on needle. 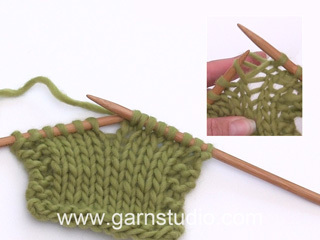 SEE KNITTING TIP! 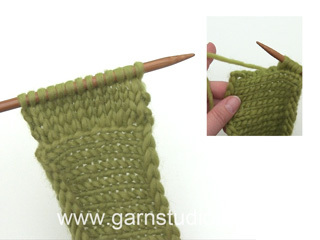 Cast on 86-92-98-106-114-122 sts (includes 1 edge st each side) on needle size 6 mm with Kid-Silk. Work 2 rows garter st - see above - and continue in stocking st. When piece measures approx 16-17-18-19-20-21 cm (adjust so that next row is from RS) change to Cotton Viscose or Safran. K 1 row on RS, AT THE SAME TIME dec 12 sts evenly on first row = 74-80-86-94-102-110 sts. K 3 more rows. Change to Kid-Silk, K 1 row from RS and work next row as follows from WS: 1 edge st, * P2 tog, 1 YO *, repeat from *-* and finish with 1 edge st. Change to Cotton Viscose or Safran, K 4 rows and change back to Kid-Silk. Now complete piece in Kid-Silk and stocking st. When piece measures 37-38-39-40-41-42 cm cast off for armhole each side at the beg of every row: 4 sts 1-1-1-2-2-2 times, 2 sts 1-2-3-2-3-4 times and 1 st 2-2-2-3-4-5 times = 58-60-62-64-66-68 sts. When piece measures 46-48-50-52-54-56 cm slip the middle 12-12-14-14-16-16 sts on a stitch holder for neck and complete each side separately. Cast off to shape the neckline at the beg of every row from mid front: 2 sts 2 times and 1 st 3 times = 16-17-17-18-18-19 sts left on shoulder. Cast off when piece measures 56-58-60-62-64-66 cm. BACK PIECE: Cast on and work like front piece. 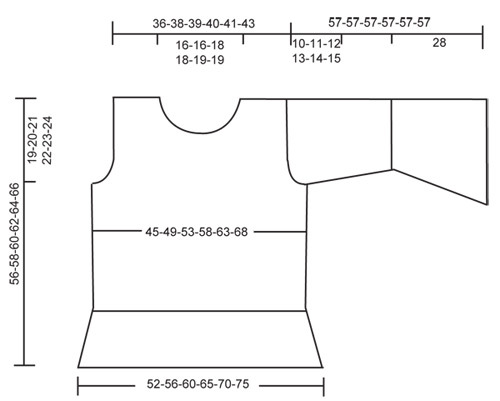 Cast off for armhole as described for front piece and continue until piece measures 53-55-57-59-61-63 cm. Now cast off the middle 24-24-26-26-28-28 sts for neck and complete each shoulder separately. Cast off 1 st on neckline on next row = 16-17-17-18-18-19 sts left on shoulder. Cast off when piece measures 56-58-60-62-64-66 cm. CUFFS: Worked in 2 parts in 2 different lengths and then knitted tog. PART-1: Cast on 80-82-84-86-88-90 sts (includes 1 edge st each side) on needle size 6 mm with Kid-Silk. Work 2 rows garter st and continue in stocking st, AT THE SAME TIME on row 5 dec 1 st each side and repeat the dec on every 3rd row a total of 18 times = 44-46-48-50-52-54 sts. When piece measures 28 cm, put it aside. PART-2: Cast on and work like Part 1, but dec 1 st each side on every other and 3rd row alternately a total of 18 times. When piece measures 23 cm, put it aside. SLEEVE: Place Part-2 of cuff on top of Part-1 (both with RS up). 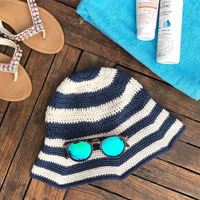 Knit them tog with Cotton Viscose or Safran as follows: Work first st from Part-1 tog with first st from Part-2, second st from Part-1 tog with second st from Part-2, etc until all sts have been knitted tog = 44-46-48-50-52-54 sts. Work 3 rows garter st with Cotton Viscose or Safran, and now complete piece in Kid-Silk and stocking st. When piece measures 31 cm inc 1 st each side on every 5-4-4-3-2-2 row a total of 6-7-7-8-9-10 times = 56-60-62-66-70-74 sts. When piece measures 47-46-45-44-43-42 cm (less for the larger sizes because of longer sleeve cap and wider shoulder) cast off for sleeve cap each side at the beg of every row: 4 sts 1 time, 2 sts 2 times and 1 st 5-6-7-8-9-10 times, then 2 sts each side until piece measures 56 cm, now cast off 3 sts each side 1 time and cast off remaining sts on next row. Piece measures approx 57 cm. ASSEMBLY: Sew 1 shoulder seam. 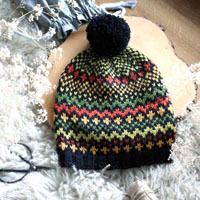 NECKLINE: Pick up approx 74 to 84 sts (incl sts on stitch holder at front) round neck on needle size 6 mm with Kid-Silk. Work 7 rows stocking st and cast off loosely. Sew the other shoulder seam incl neckline. TIE STRING: LOOSELY crochet a row of ch with Cotton Viscose or Safran and crochet hook size 3.5 mm, measuring approx 150-160-170-180-190-200 cm, turn and work 1 sl st in each ch on return row. Run tie string through casing on body piece – beg mid front. Cuffs in part two can knitted in circal neddle round shpe not flat ? Hello, Yes, you can knit them up in circular needle. Happy Knitting! I have a question,,I saw on the website that this wool must be work with needles n.3,5. in the instruction you use needles n.6. Do I have to work 2 threads together? 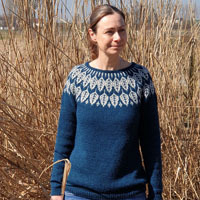 Dear Alessandra, this jumper is worked with 1 thread Kid-Silk on the basis of a gauge of 16 sts x 22 rows in stocking st = 10 x 10 cm. It is volontary worked loose. Happy knitting! I love this a lot. I'm about to start making it but I'm not clear on joining the Part 1 with Part 2. How do you continue working up the sleeve after you join Part 1 with Part 2? Are the cuffs made of two layers? Thanks a lot. Dear Monica, bottom of sleeves are made with 2 layers, put then 2 parts together as stated, and work them together as shown in the video below. Happy knitting! I am about to start part two of the sleeve and it says to cast on and work just like part one. 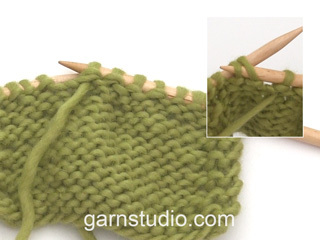 It seems like casting on the same number of stitches as the wide bell of the cuff for the part near the elbow is too many stitches. Am I supposed to cast on that many stitches for part two? Dear Mrs Donald, you cast on the same nber of sts for both part of sleeve but dec another way for 2nd part and work only 23 cm. Happy knitting ! Dear Gabrielle, it means you will work this way *knit 1 row, inc on next row, knit 2 rows, inc on next row* repeat from *-* a total of 9 times. Happy Knitting ! I am going to knit this in the smallest size - do I really need 100g of the kid silk? It seems rather a lot. Could I get away with 75g? Dear Mrs Goldby, material requirements looks correct. Happy knitting ! Die Etikette empfiehlt das Kid-Silk mit 30 Grad von Hand gewaschen wird. Är det möjligt att använda Lin för denna modell? Jag vill gärna prova Lin och älskar denna tröja! Grazie lo stesso, comunque complimenti i Vostri modelli sono MERAVIGLIOSI!!! !